Sometimes you come across pretty moronic press release. Today I received one from PNY, about a new USB flash drive designed for HP. Launched as the HP v280w, this model has a capless swivel design and seems to look pretty classy. It's available in 4GB, 8GB, 16GB and 64GB capacities, but unfortunately the drive has shockingly poor performance for a 2012 product. Even five years ago this would have been a very slow flash drive, but these days there's just no excuse for launching a new USB 2.0 flash drive with read speeds of 14MB/s and write speeds of only 4MB/s. The HP USB Flash Drive v280w ideal of a knife shaped USB drive, coming as a capless swivel design that is easy to open and close. Furthermore, its capless design also prevents cap loss and better protects the drive. Using high quality aluminum brushed-metal brings stylish glamour and also durable for long term use. HP v280w offers large capacity (from 4GB to 64GB) for a slim way to store and share all of your digital contents. There is no hindrance anymore if you want to carry your precious data on the go. Highly compatible with many operating systems and with environmental conditions, HP v280w is also suitable for business and industrial solutions as well. Measuring a mere 53.5 mm x 18 mm x 8.1 mm, this drive is incredibly lightweight at just 12.25 g, making it very compact and highly portable. 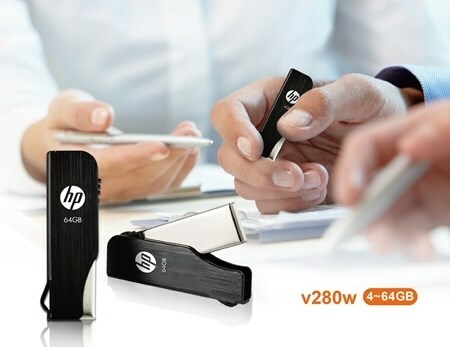 The HP v280w is available in capacities of 4GB, 8GB, 16GB, 32GB and 64GB. The drive has a USB 2.0 interface which is backward compatible with older USB ports. HP v280w assures a minimum read speed of 14 MB/s and write speed of 4 MB/s to ensures that you don't waste too much time during data transfer. 2-year warranty demonstrates a quality confirmation from PNY.